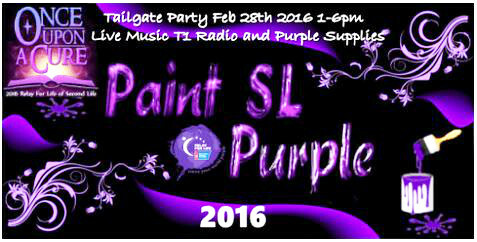 Sunday, February 28th 2016 marks the start of RFL of SL’s Paint SL Purple week. Running through until Sunday, March 6th, the campaign is aimed raising awareness and excitement as the official launch of the year’s fund-raising season for Relay for Life and the American Cancer Society draws near, by encouraging residents to paint the grid purple, the official colour of RFL of SL. Turn your world purple. Wear purple clothes, purple hair, even purple skin. Turn your house purple, paint your grass purple! Do you own a store? Paint your store purple. The goal is for people to take notice! And why purple? Because it’s the official colour of Relay For Life, and is the colour representing every type of cancer, while RFL raises money for research into all types of cancers. As well as enjoying the music and offering donations, those attending the kick-off event will be able to grab Paint SL Purple kits and t-shirts from the supply stands near the lighthouse landing point. Find out more by visiting the Paint SL Purple campaign web page, and discovering some of the many ways you can help Paint it Purple!